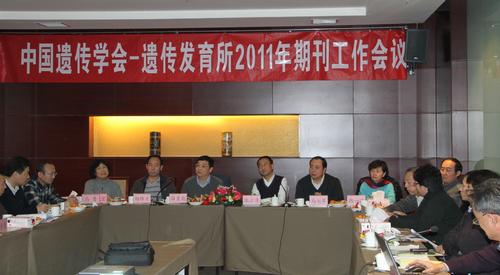 Annual Journals Meeting organized by the Institute of Genetics and Development Biology (IGDB) of the Chinese Academy of Sciences (CAS) and the Genetics Society of China (GSC) was held in Beijing on Dec 3, 2011. About forty participants including leaders from Bureau of Planning & Strategy of CAS, National Natural Science Foundation of China, IGDB, GSC, and China Science Press, editor-in-chief, associate editors and editors of Jounal of Genetics and Genomics (JGG) and Hereditas (Beijing), staff of the journals’ editorial office were present. Firstly, Shaowu Li, director of the editorial office, reported an annual work summary of Hereditas (Beijing) and presented a work plan for 2012. Hereditas (Beijing) was listed as one of the Excellence Science and Technology Journals of 2011 and its impact factor reached 0.890. The ranking of Chinese Core Periodicals in the field of biology has been boosted from 13th of 2009 to 9th of 2010. The experts attending the meeting encouraged Hereditas(Beijing) to further promote the journal academic level. In the meantime, Hereditas(Beijing) should be responsible for dissemination of genetics knowledge and culture of young scholars in China, too. Then, Dr. Ying Zhang gave a talk about JGG’s performance in 2011 and a work plan for 2012. The current JCR impact factor of JGG is 1.494 compared with 0.813 of 2009. The quantity and quality of international contributions have been significantly improved in addition to the JGG editorial office. JGG plans to publish a series of special issues on “hot topics” in 2012. The aim of JGG is to be a highimpact international academic journal in the field of genetics. Finally, Dr. YongbiaoXue, director of IDGB and editors-in-chief of both JGG and Hereditas (Beijing), pointed out that both journals should be published professionally following good standard of publication and serving the interest of public.